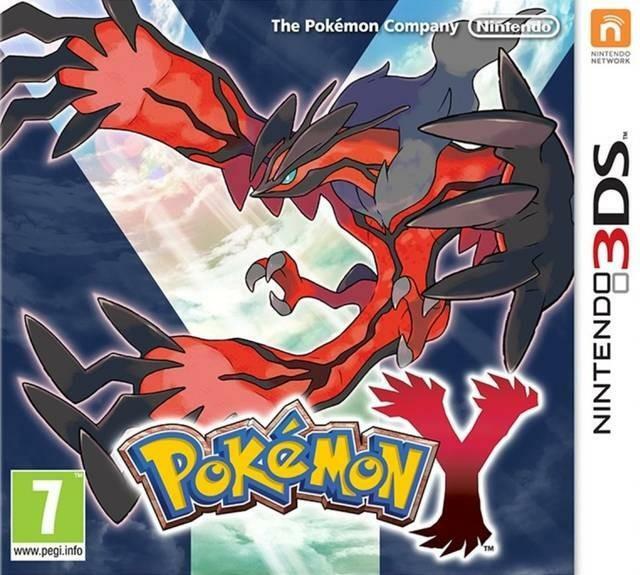 Pokémon X and Y are the main paired titles that kick off generation VI on the Nintendo 3DS. The games are set in the Kalos region, which is inspired mostly by France and more specifically Paris in the case of the games main city; Lumiose City. X and Y introduced us to 69 new Pokémon and 28 new Mega Evolved forms. 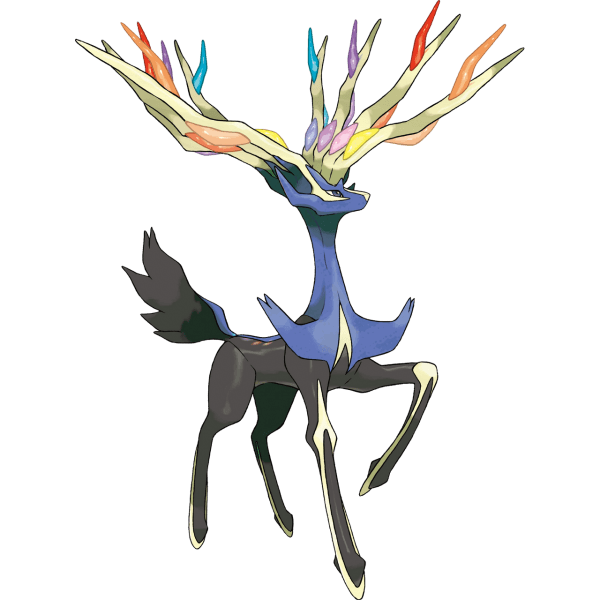 The games mascots are the legendary Pokémon: Xerneas (for Pokemon X) and Yveltal (for Pokemon Y). You may note that the legendary mascots of each games names start with the same letter as the name of the game version they feature in. These games were first announced during a Nintendo Direct announcement by Satoru Iwata on January 8th, 2013 (you can watch this Nintendo Direct in the videos section below). Additionally they were the first core series titles to be released on the same day worldwide (in terms of the standard Japan, U.S, Europe, Australia release regions at least). The titles were released in both physical retail copies and became available for digital download on this date. Regardless of your country of purchase, every copy of Pokémon X and Y has all 7 release languages built in; Japanese, English, French, German, Italian, Spanish, and Korean. Waking up from a good night sleep, the player is motivated by their mother to talk to their neighbor either Serena or Calem, then they learn that Professor Sycamore has a request for a group of five friends, the player, their rival, Shauna, Tierno and Trevor. Once the player arrives to Aquacorde Town they will have to choose one of the starter Pokémon, Fennekin, Froakie or Chespin. The Rival chooses the strong type Pokémon against the one the player picks and Shauna picks the weak one, Trevor gives the player a Pokedex. After talking to their mother in Vaniville Town, the player goes to Santalune Forest, after going through it and arriving to Santalune town they get a pair of Roller Skates and takes on the Bug Master, Viola heading to Lumiose City. Once they arrive they meet with Sina and Dexio who tell the player about Fairy Type Pokémon, there is a power outage on the city so they go to meet Professor Sycamore and meet up with their friends. Then they are able to pick a Kanto starter Pokémon. Dexio and Lysandre are talking about the potential of these group of friends, who come to the player and Tierno directs them to Café Soleil and Camphrier Town. Lysandre is chatting with Diantha, a Kalos Actress, on the Café, asking her if she wants to be beautiful forever, dismissing it as she wants to player more mature roles as she gets older. After following Route 5 they arrive on Camphrier Town, meeting Korrina and her Lucario on the way, there is a Sleeping Snorlax blocking the way being forced to go to Parfum Palace where Shauna helps the player to find a lost Furfou before the fireworks show. As a prize they get the Poke Flute with which they wake up the sleeping Snorlax being able to advance to the Connecting Cave. Being forced to follow an alternative way the player gets to Route 8 where they receive the Coastal Kalos Pokedex, right before arriving to Ambrette Town where they ride a Rhydon through route 9 before entering the Glittering Café, inside, along with their Rival, they face Team Flare and rescue a Scientist. Going through the coastal part of Route 8 the player gets to Cyllage City, where he beats Grant to get the Cliff Badge, the player meets with Korrina while passing through Geosenge Town, she tells them that Lucario senses something in the player’s Aura. After Passing through the Reflection Cave they get to Shalour City, getting a message telling them to visit Gurkinn, the Mega Evolution expert who is in the Tower of Mastery. 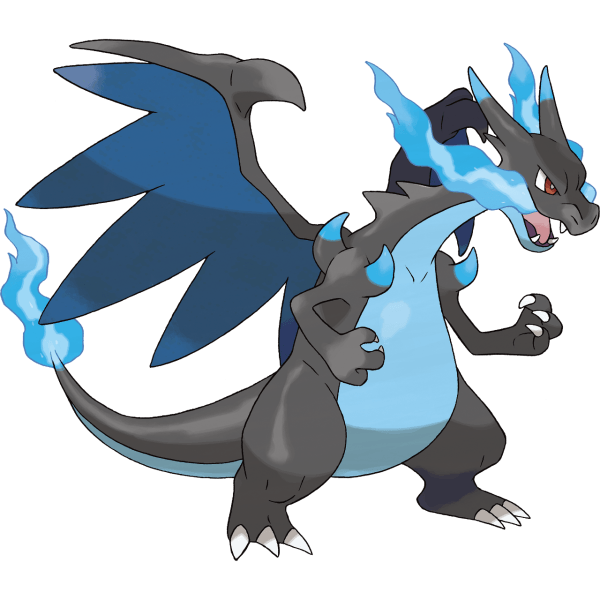 Charizard in one of it's Mega Evolved forms.Gurkkin then tells the player and their friends about Mega Evolution, which requires a Mega Stone, Mega Ring and a bond between the Trainer and Pokémon. Gurkinn only has one mega ring, and everyone decides that the player should get it, Korrina tells them to go to her Gym to defeat her first. After she is defeated, the player receives the Mega Ring, the Rumble Badge and A Lucario who has Lucarionite; Afterwards, the player heads to Coumarine City where he challenges Ramos, getting them the Plant Badge, walking through route 13 he finds Sina and Dexio who give them the Mountain Kalos Pokedex. The player is unable to go to Lumiose City because of the Power Outage making them go to the power plant where they find out that Team Flare is wreaking havoc but after defeating a Scientist the power is restored to Lumiose City, opening the path so the player can battle Clemont and get the Voltage Badge. The player then goes to Laverre City beating Valerie to get the Fairy Badge. The player and their friends find team Flare at the pokeball factory, fending them off after defeating Celosia and Bryony. As they arrive to Dendemille, Professor Sycamore and his aides discuss the legend of Xerneas or Yvetal. Unable to get to Anistar City because of the Mamoswine who is on route 17 being gone, the player is forced to go to Frost Cavern to find it. Here the player has to defeat Mable to, once again, fend off team Flare, save an Abomasnow, and calm the Mamoswine so the player can move to Anistar city where he gets the Psychic Badge from Olympia. On his way out of the gym, Lysandre reveals that he has plans to use the ultimate weapon, the player then travels to Lysandre Labs to defeat him and the four scientists who assist him. The player then discovers that he has imprisoned AZ. Lysandre tells the story of how AZ used the ultimate weapon to revive his Floette and then used it to end the war 3,000 years ago. He promises that if the player defeats Xerosic, he will turn the ultimate weapon of, but Xerosic turns the weapon on remotely and unleashes it on Geosenge Town. At the team flare secret HQ there, Lysandre tells of his plans to eradicate all Pokémon and people who do not agree with his ideals. After defeating him and catching the Legendary Pokémon, Lysandre will try to use the remaining energy in the weapon for his goals just to be caught on the destruction it causes. Following their way to Couriway Town and Snowbelle City the player arrives and finds out that Wulfric is missing, in order to find him the player has to go to the Pokémon Village, where Wulfric explain that the Pokémon there once were abused. After returning to his city gym and battling the player he rewards the player with the Iceberg Badge after being defeated. With their final Badge in hand, the player goes through route 21 into Victory Road and then to the Pokémon league where they have to face the elite four. The elite four consists of Malva, the Fire Type Pokémon Specialist, Wikstrom, the Steel Type trainer, Drasna who uses Dragon Type Pokémon and Siebold the Water Type Pokémon Elite, after that they face the Kalos Champion, Diantha. After entering the Hall of Fame, Sycamore organizes a parade for the player. During this parade AZ asks the player for a battle, after the battle AZ says that he finally knows what it means to be a trainer and his Floette appears from the sky, getting together with him again. True 3D Gameplay: It is the most important advancement implemented in the games, making full use of the 3DS's ability to utilise full stereoscopic 3D graphics for the first time in the Pokemon series. The Pokémon and the characters are now fully animated in 3D models. The environment too is well designed and filled with 3D objects to fit the gameplay. Due to this change, the battles are way more dynamic and Pokémon feel more alive, especially with the addition of Pokémon reactions when they get hit. Movement: The player's character, which is controlled from an overhead third person perspective, can move in 8 directions, as diagonal movements are now possible. The player can still use the bicycle, along with roller skates that have a slower movement speed than the bike. Furthermore, some Pokémon even be rode now in specific areas, including Rhyhorn and Gogoat, and which can interact with different object in the Pokémon World. Fairy-Type: Due to the fact that the Dragon-Type was considered by most to be too strong, as it only had two weaknesses, the Fairy-Type was added as a third weakness for it. It is the first time, since the second generation games, that a Pokémon type got added. 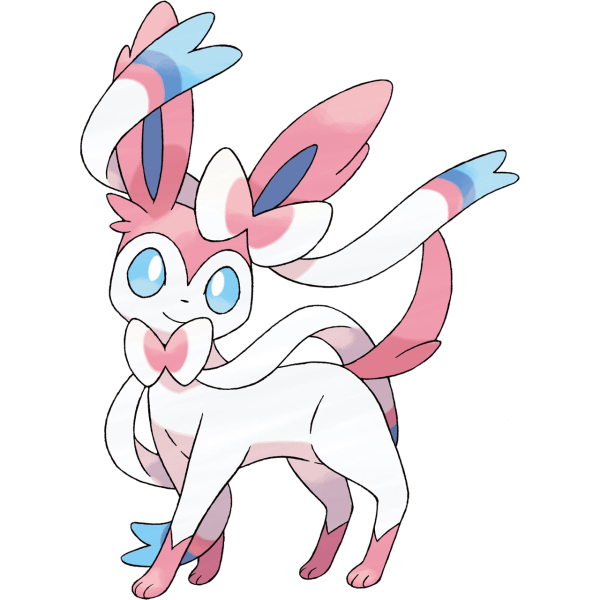 The Fairy-Type is strong against Dark-Type and Fighting-Type, completely immune to Dragon-Type moves, and weak against Fire-Type, Poison-Type and Steel-Type moves. Mega Evolution: Another new feature that allows a few Pokémon to transform during battle, increasing their stats and changing their appearances and abilities. The Mega Evolutions happen when the player attaches certain Mega Stones to their Pokémon, then, activates the Key Stone they have. The Key Stone will resonate with the Mega Stones attached to the Pokémon, forcing them to enter the Mega Evolution state during battle. Super Training: It is a new training method introduced in X and Y, which helps increase the Pokémon stats and not their levels. The player can also use different Training Bags to alter and customize their Pokémon progess. Sky Battle: It is a new battle mode where only Pokémon of the Flying-Type or those with the ability Levitate can participate. The Pokémon will battle in sky, as their trainers will remain far away on ground level. Pokémon-Amie: Using the touch screen, the player can interact with the Pokémon they have in their party, feeding them, petting them and even playing with them. This process will increase the Pokémon's friendliness and strengthen its relation with its trainer. Player Search System: The PSS feature allows the user to look for other players in the internet, on a local and global level, enabling them to trade Pokémon, chat and battle against others. Horde Encounters: This feature offers the possibility to encounter up to 5 Pokémon at the same time, which the player will also have to battle simultaneously. Each turn the five Pokémon will attack the player's one, which makes the battle harder but also very rewarding in terms of experience. Moves that target a whole area can hit all the Pokémon at the same time, thus, having a Pokémon with such moves can greatly help farm exp. Character Customization: This feature allows the player to customize their character, whether it's a male or female. They can change their haircut and hair color in Salons, with a variety of choices. New clothes can be bought at Boutiques and clothes shops, and can later on be changed in Fitting Rooms. The player may also change their character's eye color with contact lenses and even use make up. Pokémon X and Y introduce 72 unique new Pokémon, making the National Pokédex reach 721 in total. Similarly to Pokémon Diamond and Pearl or Black and White, the games also have Pokémon exclusive for each version. There are also quite a few that can be acquired through in game trade. Moreover, the games introduced new powerful legendaries that may be caught throughout the course of the game. After beating the Elite Four, the player can acquire another starter by meeting Shauna outside their house. She will give them the starter, who's weakest against the starter the player chose at the start of the game. The games take place in the Kalos region, which similarly to Unova, is located way far away from Hoenn, Johto, Kanto and Sinnoh. The region is shaped like a bit like a star and with wide green areas through which many rivers flow. The region also has a mountainous area, known for its cold weather. Lumiose City is located in the northern central area of Kalos, and it is the region's biggest city. Kalos, which name means "Beauty" in Greek, is very much inspired from France, its geography and its monuments, as the example of the Prism Tower which is inspired of France's Eiffel Tower. Old tales state that nearly three thousand years ago, a large scale war happened in the region, called the Kalos War. During the war, AZ the former king of the region created the Ultimate Weapon, with which he ended the war and was said to be given eternal life. The weapon now lies underground, beneath Geosenge Town and requires an insane amount of energy to be activated. 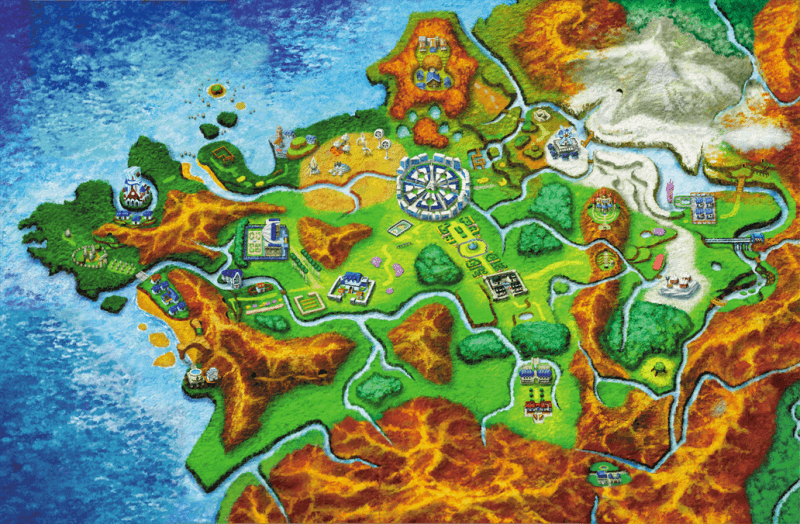 A map of the Kalos Region. It is the evil organization of the Kalos region. Just like most of the series' villainous teams they aim to gain control of the region, profit from the Pokémon and realize their boss Lisandre's dream, which consists of rebuilding the world into a more beautiful and better one, in the way he sees fit. To do so, Team Flare is planning to use the Ultimate Weapon buried underneath Geosenge Town to destroy humanity then rebuilt it, supplying the weapon with energy from the legendary Pokémon Xerneas in Pokémon X or Yveltal in Pokémon Y. 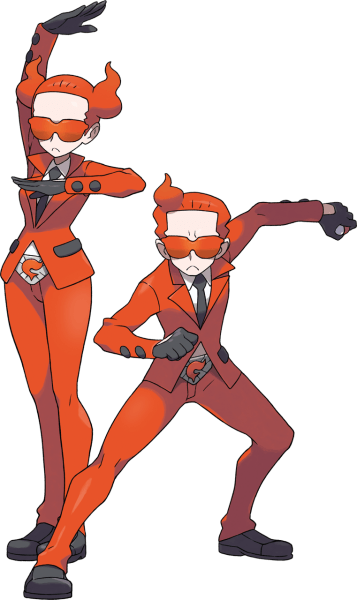 Throughout the games, the player will encounter many Team Flare grunts, their Team Admins and their Top Executives who are Aliana, Bryony, Mable and Xerosic. Meet the eight gym leaders of the Kalos region. You'll need to take on and defeat all of them if you want to enter the Pokémon League and challenge the Elite Four. Each gym leader has his/her own specialist type and as such will have his or her own weakness. Viola is a master of Bug-type Pokémon and a keen photographer, she is known to some as "The camerawoman who never lets a single smile escape her focus.". Her elder sister Alexa is a journalist and she's the one who gave her the camera as a gift. Valerie is said to be the one who bought her the barrette to go with it as a birthday present. Viola's bug duo consists of Surskit (Level 10) a water/bug type and a Vivillon (Level 12) a flying/bug type. If you can defeat Viola she'll reward you with the Bug Badge as well as TM83 (Infestation). "That determined expression... That glint in your eye that says you're up to the challenge... It's fantastic! Just fantastic! Is this your first time challenging a Gym? Fantastic! Whether it's the tears of frustration that follow a loss or the blossoming of joy that comes with victory... They're both great subjects for my camera! Fantastic! This'll be just fantastic! Now come at me! My lens is always focused on victory--I won't let anything ruin this shot!" 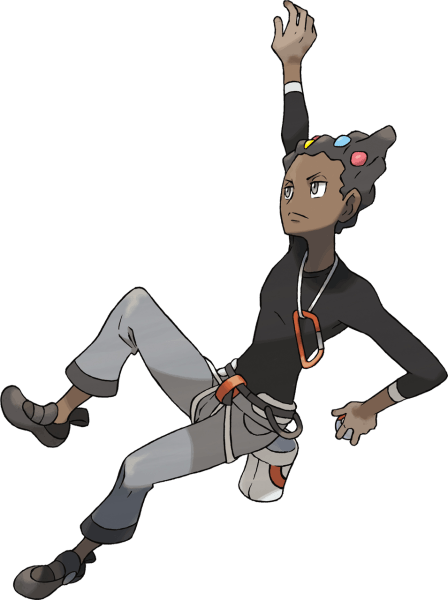 Grant is a specialist in Rock-type Pokémon and is known by some locally as "The wild, yet cool and collected, rock climber.". As well as being passionate about he and his Pokémon's training Grant also excels in a sporting activities like bike racing and mountaineering. The TV show Gym FReaks described Grant as being a bit of a trend setter, and very fashionable with his 'rolling stone' hairstyle being particularly popular amongst the younger generations. Grants Pokémon are Amaura (Level 25) a rock/ice type and Tyrunt (Level 25) a rock/dragon type. "I've been waiting in eager anticipation! What have I been waiting for? For a worthy challenger to appear! It's quite an achievement to have climbed all the way up here. Very impressive, actually! I have a feeling that our battle will turn out to be worth the wait! I hope you'll show me that your skill as a Trainer surpasses even mine." Korrina is a fighting-type specialist, and she's unique in the fact that her trainer class is 'successor', she goes by the monika of "The Evolution fighter!". The Gym Freaks TV show described her as being a PR Video star and described how she likes to dress up in fancy costumes but also gave admiration for her martial prowess stating that with her magnificent legs she's able to shatter rock with her axe-kick move. Her team of fighters includes Mienfoo (Level 29) a pure fighting type, Machoke (Level 28) a pure fighting type and Hawlucha (Level 32) a fighting/flying type. Knock out Korrina's best fighting mon's in order to recieve the Rumble Badge and TM98 (Power-Up Punch). "Time for Lady Korrina's big appearance!" "Haha, I'm just messing around with you! I know, you're rollin' in the aisles, right? I already know you're a strong Trainer, so let's get this show on the road!" come as no surprise that Ramos refers to the player as "whippersnapper" and "sprout" - It's almost like he was inspired by Tommy's Grandpa from The Rugrats. The TV Show Gym Freaks observed that Ramos has owned his gardening scissors for 30 years and that he's pretty into Tea thesedays, even travelling the world to obtain the best tea from it's source. His trio of plant based mons includes: Jumpluff (Level 30) a grass/flying type, Weepinbell (Level 31) a grass/poison type and Gogoat (Level 34) a pure grass type. Defeat Ramos in battle to obtain the Plant Badge and TM86 (Grass Knot). "Ho! So yeh've made it clear up here! I'm the Gym Leader. Ramos's the name. So what'd yeh think, whippersnapper? Did yeh enjoy the garden playground I made with all these sturdy plants o' mine? Their strength is a sign o' my strength as a gardener and a Gym Leader! Yeh sure yer up to facing all that?" 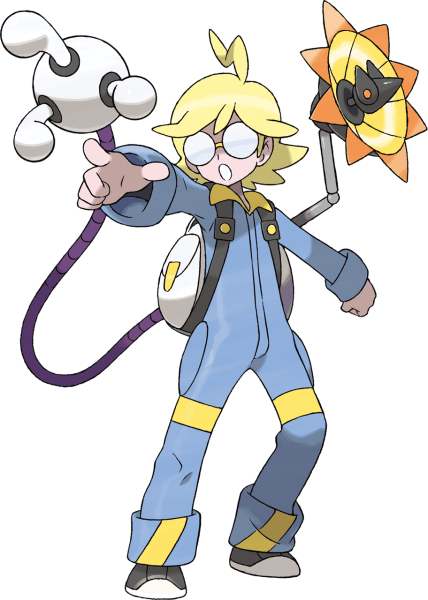 Clemont is a specialist in electric type Pokémon and keen inventor, he is known to some as "The inventor lighting up the world.". The Gym Freaks TV Show reports that Clemont is currently working on a machine which will allow him to run faster, as running has always been a bit of a weak spot for him. He's also rumoured to be saving up for a trip to the Unova region to visit their amusement park. He is a genius who is responsible for Super Training being invented; but in spite of this he has created a chain of inventions that didn't work. Clemonts team consists of Emolga (Level 35) a flying/electric type, Magneton (Level 35) an electric/steel type and Heliolisk (Level 37) an electric/normal type. If you can overcome Clemont and the shocking attacks of his team you'll earn yourself the Voltage Badge and TM24 (Thunderbolt). "Oh! Thank you again for coming. Allow me to introduce myself..."
"Bonnie! How many times do I have to remind you... It's not my own strength that matters, nor any other Trainer's. None of us would be here if it weren't for our Pokémon." "She's right about that, at least. Let's both do our best in battle." Valerie is a specialist in Fairy-type Pokemon and is known to some as "The maiden from a land with history. ", she's actually from Johto originally. When Valerie isn't training her Pokemon or battling in her gym she's a fashion designer with a deep appreciation for beautiful things. The outfits Valerie designs are extravagant and she designs the with a view of trying to connect even better with her fairy Pokemon through what she wears. The Gym Freaks TV Show says that she used to be a model and thats why she can wear such high heels, it also states that her outfit weighs around 33lbs! Her team is made up of: Mawile (Level 38) a steel/fairy type, Mr. Mime (Level 39) a psychic/fairy type and a Sylveon (Level 42) a pure fairy type. "Oh, if it isn't a young Trainer... So you've flown all the way through my Gym, fluttering down to me on a fortunate wind. Then I suppose you have earned yourself the right to a battle, as a reward for your efforts. I am Valerie, who leads this Fairy-type Gym. I hope your visit will prove entertaining to you. The elusive Fairy types may appear frail as a breeze and delicate as a bloom, but they are strong." 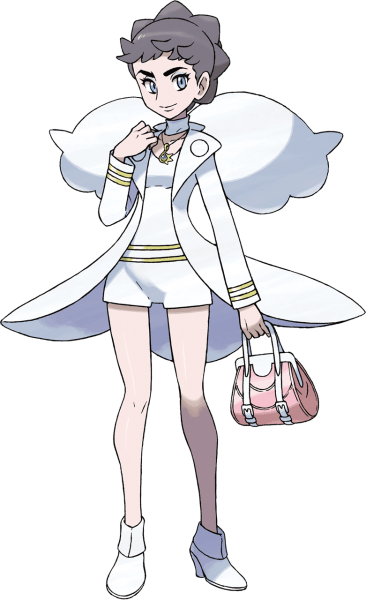 Olympia is a specialist in Psychic-type Pokemon and the leader of the penultimate gym in X and Y, some people know Olympia as "The person who makes paths with starlight.". She talks in haiku, appears like a fortune teller, and often talks of peoples fates and futures. The Gym Freaks TV Show reported that anyone who puts their wrist into Olympia's Bracelet will allow her to see their future. It's also observed by Gym Freaks that the inside of her cloak is decorated like a galaxy in order to create a zero gravity effect and increase psychic power. Olympia commands the following Pokemon: Sigilyph (Level 44) a psychic/flying type, Slowking (Level 45) a water/psychic type and Meowstic (Level 48) a pure psychic type. If you pulled out enough moves that Olympia didn't see coming, and manage to beat her you'll get the Psychic Badge and TM04 (Calm Mind) as your rewards. "A ritual to decide your fate and future. The battle begins!" Wulfric presents the final gym challenge of the Kalos region alongside his team of Ice type Pokemon and is described as "Tough as an iceberg, hot as a furnace.". Wulfric is said to be kind and compassionate toward all Pokemon despite his tough demeanour, in return he is well liked by Pokemon and people alike. Gym Freak describes Wulfric as a big fan of the Byrcen-Man series, he even cried during it's latest movie. It's said that the locket he wears around his neck contains a photo of his most loved Pokemon. Wulfrics impressive lineup consists of Abomasnow (Level 56) a grass/ice type, Cryogonal (Level 55) a pure ice type and Avalugg (Level 59) another pure ice type. 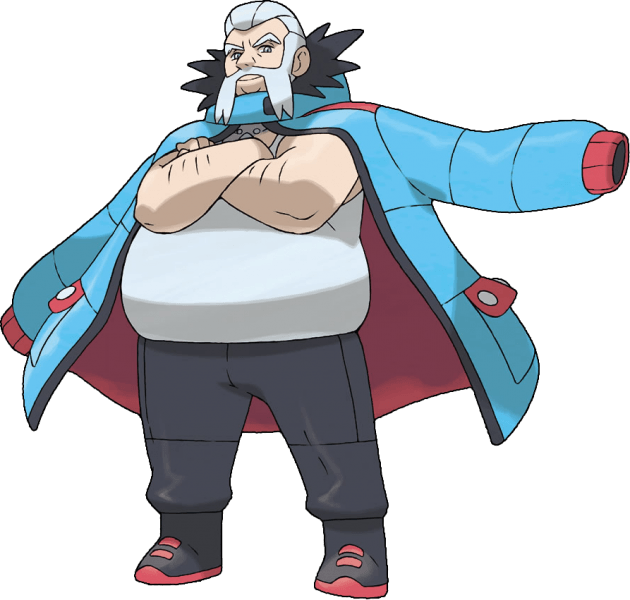 If you can defeat Wulfric you'll earn the final badge you need to enter the Pokemon League and take on the Elite Four; the Iceberg Badge, he'll also give you TM13 (Ice Beam). "Y'know what? Ice is both extremely hard and terribly fragile at the same time. You know what that means? Depending on which Pokémon you choose and what moves they use, I could be your most challenging opponent yet or I could be a total pushover. But that's all right. That's how it should be! Anyway, enough of my rambling! Let's get this show on the road!" 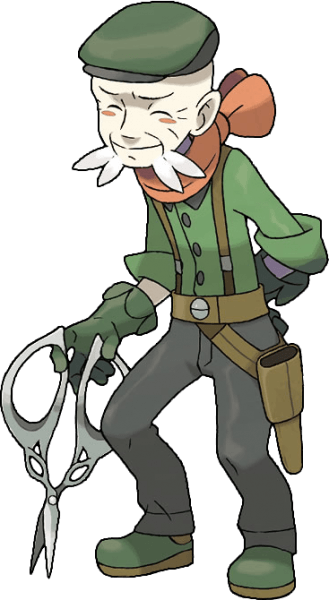 The Elite Four of Kalos is a mixed bag including Noble & Chivalric Steel Type users, a disgruntled member of the now-defeated Team Flare and a famous chef. You'll need to beat all of them consecutively if you wish to take on the Pokémon League Champion. Read all about them below! Malva is the first member of the elite four you will face in Kalos. She is a fire type master and also a member of Team Flare. Malva is also a news report, even proclaiming herself the star of the holo caster. Being part of Team Flare, Malva is not too welcoming to the player, knowing they had a role in her teams defeat. Her rank within Team Flare isn't known but it must be reasonable because she knows classified information. 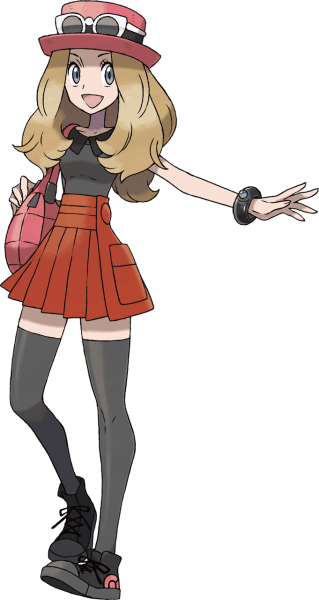 Her team is made up of: Pyroar (Level 63) a fire/normal type, Torkaol (Level 63) a pure fire type, Chandelure (Level 63) a ghost/fire type and Talonflame (Level 65) a fire/flying type. 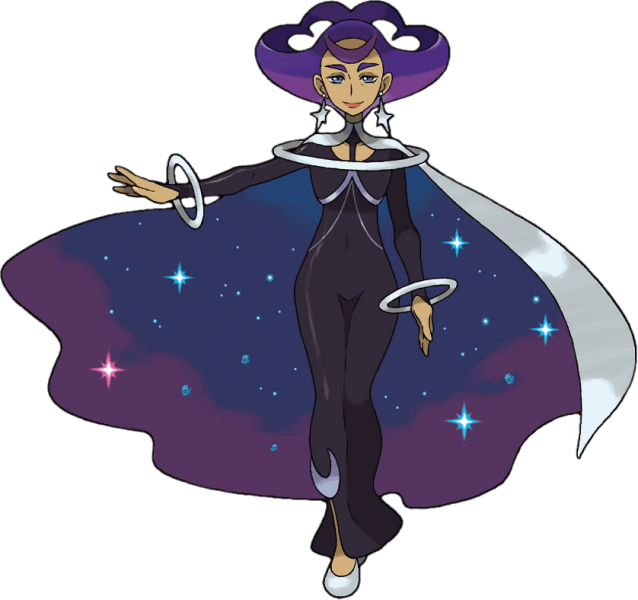 Defeat Malva in her Blazing Chamber in order to proceed to the next Elite Four battle. "You're the illustrious , are you? Welcome at last to the Pokémon League. I am one of the Elite Four. People know me as the Fire-type-Pokémon user, Malva. Here in the Pokémon League, you'll encounter the four of us--the Elite Four--and our Champion. If you hope to meet the Champion and challenge her here, you must first defeat the four of us. Do your best, because if you can't impress us with your real strength, you'll never get to battle her. But it should be a walk in the park for you, right? The "hero"/"heroine" who destroyed big, bad Team Flare." Siebold is the second member of the Elite Four you will face in Kalos, he is a master of water type Pokemon. It's also been noted that he is a famous Chef, preparing his famed meals at the Restaurant Le Yeah, an npc noted that he sometimes cooks for Grant and Valerie. His team consists of a Clawitzer (Level 63) pure water type, Gyarados (Level 63) a water/flying type, Starmie (Level 63) a water/psychic type and Barbaracle (Level 65) a rock/water type. Siebold must be defeated in order to reach the third member of the Kalos Elite Four. "... ... ... No, I simply can't say." "You there! Young man/lady! I have a question I must pose to you. Do you think Pokémon battling can ever be worthy of being called an art?" Yes: "... ... ... Indeed. You see, cooking is the type of art that disappears as soon as it is completed. Pokémon battles are the same. Even memories of sweet victory soon fade after the battle ends. To devote yourself entirely to such a life, made up of fleeting experiences--that is truly artful." No: "Fool! You silly, unseeing child! If all you seek in life is to fill your stomach with some tasteless matter, then why are there Chefs in this world?! We labor tirelessly to make something wonderful that will disappear from sight as soon as it is enjoyed. That is the life of a Chef! That is the life of a Trainer!" 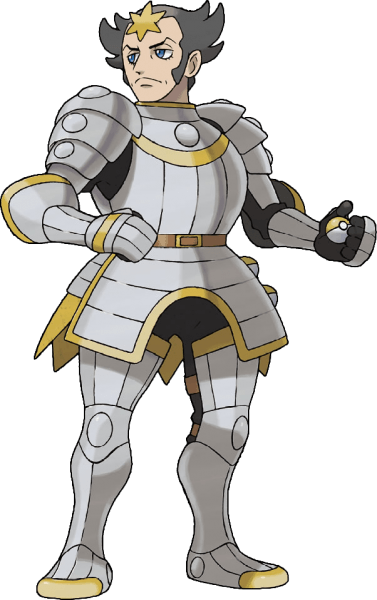 Wikstrom is the armour clad third member of the Kalos Elite Four and a specialist in Steel-type Pokémon. His mannerisms of chivalry and honour match his dress which resembles that of a Knight of Old. You will face the following Pokémon when you take on Wikstrom: Klefki (Level 63) a steel/fairy type, Probopass (Level 63) a rock/steel type, Scizor (Level 63) a bug/steel type and Aegislash (Level 65) a steel/ghost type. Proving yourself against Wikstrom in battle will grant you the right to challenge the leader of the Elite Four of Kalos in the next chamber. "Well met, young challenger! Verily am I the Elite Four's famed blade of hardened Steel, Wikstrom! With my magnificent Pokémon at my side, I will reveal the scope of Trainer achievement! Let us both give our word that our contest shall be fair and honorable. Ready? En garde!" 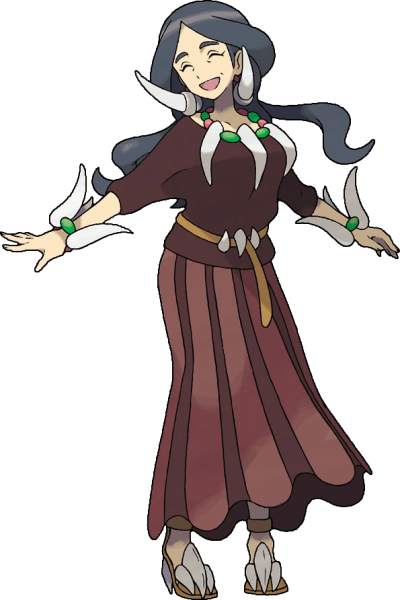 Drasna is the leader of the Kalos Elite four and a master of the powerful Dragon-type. It is said that Drasna was inspired to train Dragon-types by her grandparents, they were from the Sinnoh region and taught her about the myths and legends of Dialga and Palkia, the legendary Pokémon of that region. Even when faced by the player who by now is getting a reputation for defeating Team Flare and of course the three elite four members before her, Drasna remains calm and composed, hinting at a great confidence in the strength of herself and her Pokémon. Drasna's Dragon Squad is formed of: Dragalge (Level 63) a poison/dragon type, Druddigon (Level 63) a pure dragon type, Altaria (Level 63) a flying/dragon type and Noivern (Level 65) a flying/dragon type. "Oh goodness, hello to you! Welcome, welcome, come in. You must be a strong Trainer. Yes, quite strong indeed... That's just wonderful news! Facing opponents like you and your team will make my Pokémon grow like weeds!" 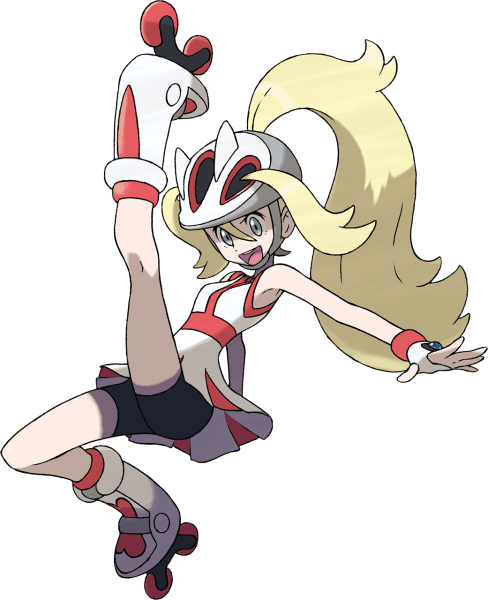 Originally famed for her acting career as a movie star and now famed even more for being the Champion of the Kalos region, Diantha is a well known and well regarded figure across the Kalos Region. Despite this however Diantha is far from self centred and seems to have more interest in other trainers with the potential to be great than she does in furthering her own abilities, for example she takes a special interest in the player much earlier in the game after their encounter in Café Soleil, Lumiose City. Diantha's fully stacked team of six includes the following: Hawlucha (Level 64) a flying/fighting type, Tyrantrum (Level 65) a rock/dragon type, Aurorus (Level 65) a rock/ice type, Gourgeist (Level 65) a ghost/grass type, Goodra (Level 66) a pure dragon type and Gardevoir (Level 68) which is a psychic/fairy type and notably holding a Gardevoirite enabling Mega Evolution in battle. "Welcome at last, dear Trainer. As you must know, I am the Champion, Diantha. Oh, but you are... You're the child I spoke to in Lumiose City and Coumarine City, aren't you?! Then that means that you are also the one that dear Augustine said... Of course! How could I--?! Oh, I must look like such a fool not to recognize you sooner! You and your Pokémon are the ones who stopped Team Flare for us all! It seems wrong of me to say this, but thank you! You saved us all... I can't wait to see what you and your Pokémon are capable now that I know exactly what it is you've done already!" Both Pokémon X and Pokémon Y are compatible with the rest of the sixth generation Pokémon games, including, mainly, Omega Ruby and Alpha Sapphire. You can transfer to and from those games, except for the additional Mega Evolutions that were added in Omega Ruby and Alpha Sapphire and weren't present yet in X and Y. 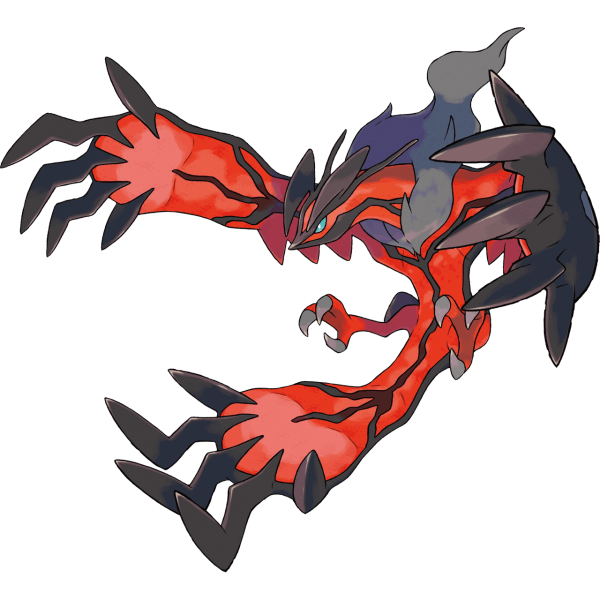 The player can also battle with other players that possess those games, abiding by the same restriction rule for the new Mega Evolutions. 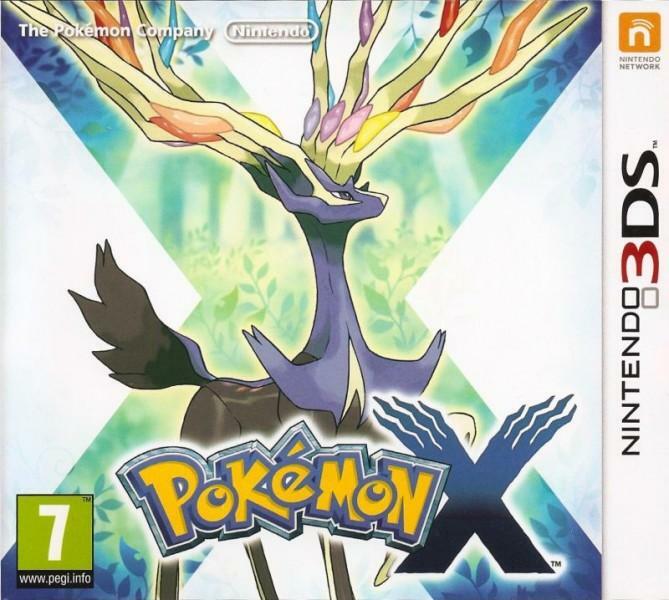 Unlike the previous titles such as Black and White and their sequels, Pokémon X and Y cannot be linked directly to the games from the previous generation. But, since X and Y can be linked to Poké Transporter and Pokémon Bank, the player can first transfer the previous generation's Pokémon to those titles and then transfer them to either Pokémon X or Y. 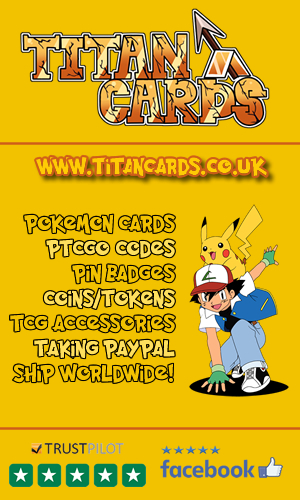 Connecting the games to the website of Pokémon Global Link will allow the use of several online features, such as the PokéMileage Club. Check out these Pokemon X and Y videos including trailers, commercials and intro videos. A TV Commercial for Pokémon X and Y. The Official Trailer for Pokémon X and Y. The E3 2013 Gameplay Trailer for X and Y. A selection of music/themes which were present in the game data for X & Y but were not utilised in the final release version. The Nintendo Direct video where Satoru Iwata announces Pokémon X and Y. The Mega Evolution sigil can be seen in the Japanese and Korean logos for X and Y but wasn't included on Western logos. X and Y are the only core series paired titles that didn't have a third game follow up in the same region. X and Y are the first core series titles not to use the word Version in the game titles. These were the only physical release core series titles which released on the same date worldwide. Post Pokémon Platinum these are the only core series titles where you don't hear the game mascot's cry when you press start on the title screen. 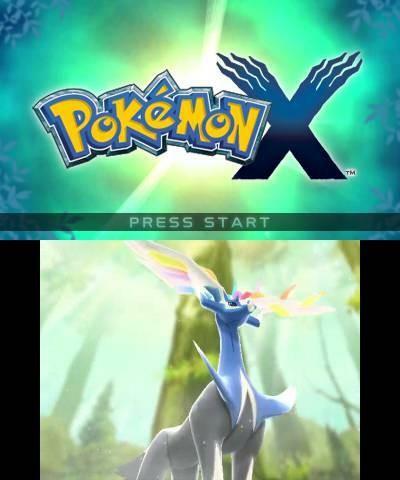 Usually in the core series there is an intro before you get to the title screen, in the case of X and Y the intro comes AFTER the title screen. The titles of X and Y are named after their namesake axes in the Cartesian coordinate system. The Pokemon Helioptile and Heliolist are derived from Greek mythology. Helios for example if an ancient Titan in Greek mythology who personifies the sun and the pokedex entry for Helioptile states "it basks in the sun to get energy" which also supports this. There is an old man who is depressed due to the death of his wife in Anistar City. He asks the player to leave a low level Pokemon with him as a bit of company. If you leave one with him, go off and defeat the Elite Four and then come back to the house you'll find that he has since passed away, he will have left the Pokemon in it's Pokeball and left a note for the player, thanking them and commenting that the Pokemon you let him look after kept him "smiling until the very end". He also leaves the player a Comet Shard. All new generations prior to X and Y added more than 100 new Pokemon. X and Y added less than 100 Pokemon and instead supplemented with Mega Evolutions. 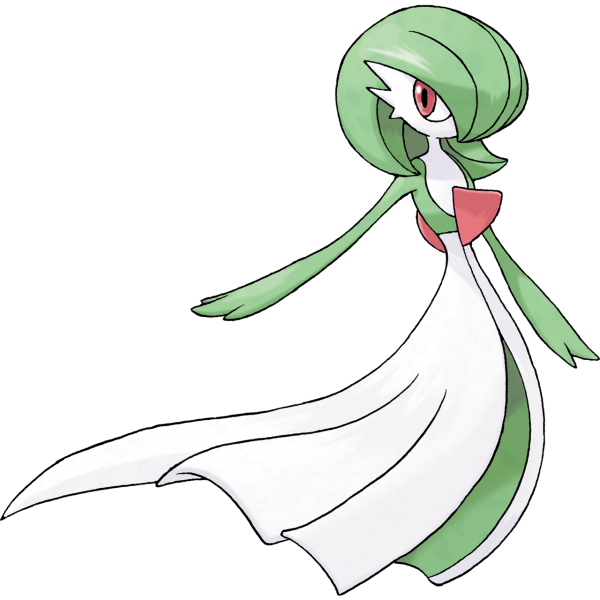 There is evidence to suggest that Valerie, the sixth gym leader in X and Y is originally from the Johto Region. 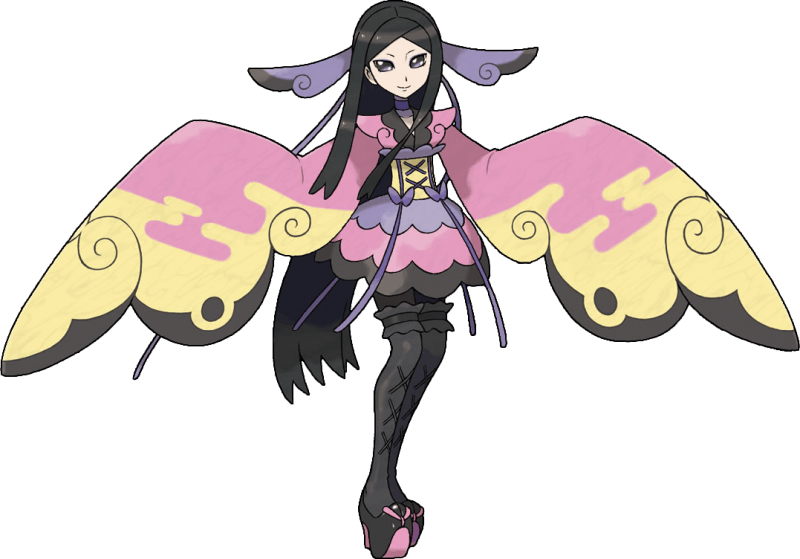 Add this to the fact that she wears a Kimono and her highest level Pokemon is Sylveon it could be that she is related to the Kimono Girls from the Pokemon Anime & of course the Gold, Silver, Crystal titles (and their respective remakes). All of said Kimono girls also specialise in Eevee training. The band Union J changed their names to "Union XY" on the global release day of X and Y. (Just for the day of course). 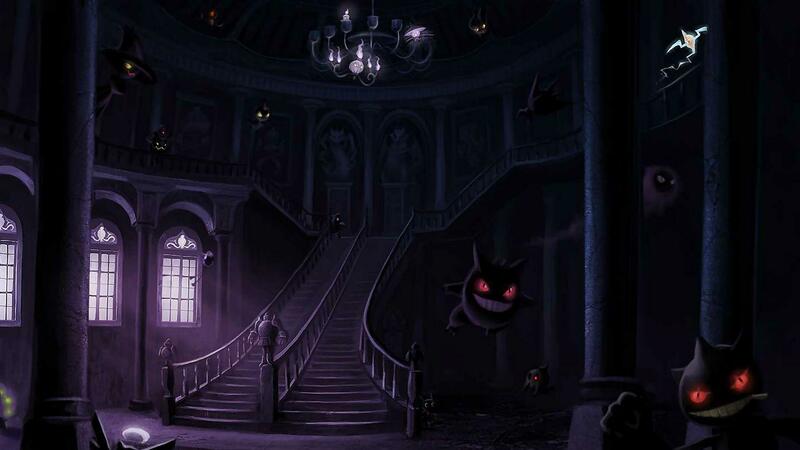 Artwork from various Pokemon Trading Cards appear in Lumiose City's Museum. This includes artwork from the Fossil Excavator and Town Volunteers cards. There is an Ace Trainer in a house in Coumarine City. Speak to him and he will play a remastered version of one of the songs from Pokemon Black and White's soundtracks. The song is called "Unwavering Emotion". Visit a Pokemon Center on your birthday to recieve a happy birthday message! Junichi Masuda has stated that the name of X and Y's region "Kalos" is derived from Greek and translates roughly to mean "Beauty". 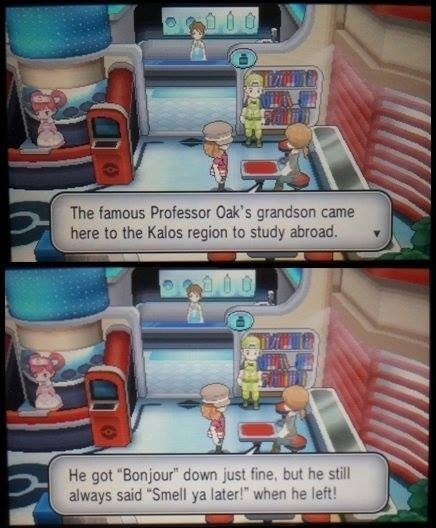 Furthermore the Kalos Region is based on France (Paris inparticular). During the second UK released Trailer for X and Y you see Yveltal using Hyper Beam, when he does you hear the same sound effect that was used in Red & Blue version for this move. 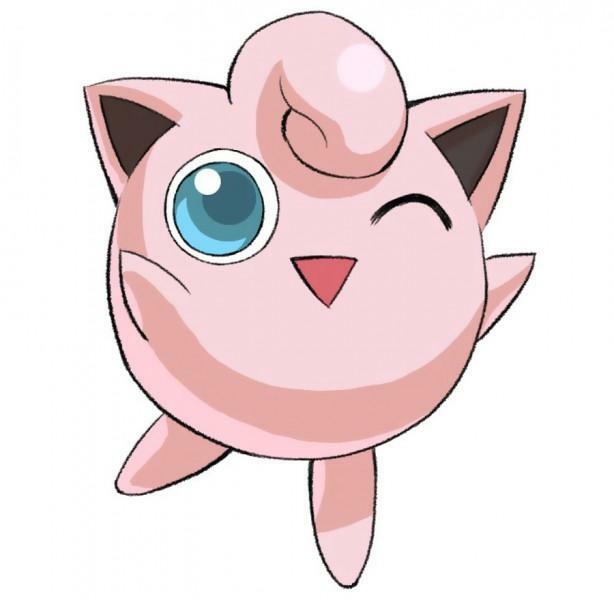 Fairy type Pokemon were introduced in this gen in order to right the power imbalance and create a direct counter for Dragon Types which had long been considered overpowered by Game Freak. Pikachu's cry in Pokemon X and Y was changed to sound like it does in the anime. 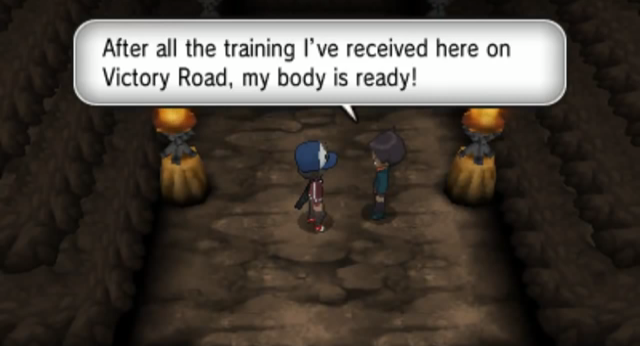 An NPC called Veteran Timeo quotes "After all the training I've recieved here on Victory Road, my body is ready!". This is in reference to a quote by Nintendo of America's president Reggie-Fils-Aime at E3 2007 just before he did a Wii Fit demonstration. In their first weekend of release over 4 million copies sold globally. In further statistics taken on June 30th, 2017 figures show that more than 16 million units had sold. In terms of which was more popular; X vs. Y, limited information is available but in the United States back in August, 2014 Pokémon X had sold 2.1 million units to Y's 2.01 million, so it looked to be pretty even. The trend of ever increasing review scores was bucked with Pokémon Black & White Version 2's falling slightly short of the original Black & White titles however the release of X and Y sought to quickly correct this, bringing some of the best reviews and reception from critics and players that the titles had enjoyed in a while, here's some of it's scores. Japanese gaming publication Famitsu scored the games a near perfect 39/40, and they don't give out that sort of score lightly. Aggregation scores on Metacritic show an average score of 87/100 over 71 critic reviews. Exactly the same aggregate score as Black & White infact. An average of 879 Metacritic user review scores resulted in an overall rating of 8.5 out of 10. X and Y hold a strong 87.26% overall score on GameRankings across 45 reviews, up nearly 6% from its predecessor titles B&W V2. Jose Otero from IGN weighed in with a score of 9 out of 10 for X and Y. "Every so often, evolution takes a significant leap. Pokemon X and Y is smarter, better, and faster than its predecessors, but it’s the impressive online social features and fantastic new 3D look that make the latest game in the 15-year-old RPG series amazing". GameSpot's Randolph Ramsay scored X and Y 8/10 equating to "Great" on the GS scale. He praised the visuals of the game and the Pokemon, the compelling gameplay and the fact it was less grindy than some previous titles had been but thought the game could've been more challenging. DetroitDJ reviewed the game on behalf of Pokemon Dungeon and scored it 4 out of 5 stars. "A must-play for Pokemon fans and those who have never tried the series. Those who haven't enjoyed Pokemon in the past, though, probably still won't."